Amount per Serving (4 Tablets - 2000mg) | L-Leucine: 1000mg | L-Isoleucine: 500mg | L-Valine: 500mg. Branched Chain Amino Acids consist of the three amino acids Leucine, Isoleucine and Valine. BCAA's can't be produced by the body therefore must be supplied by diet. 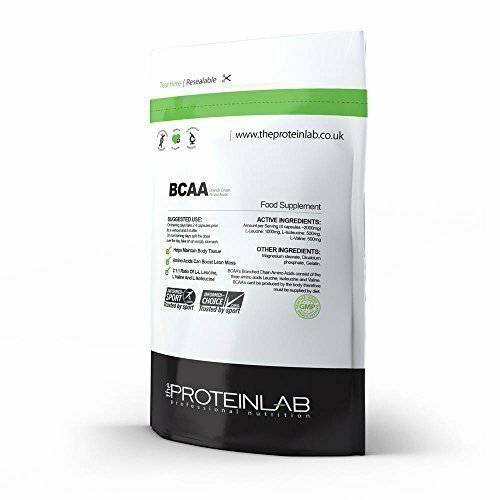 The Protein Labs BCAA's have been specially formulated to be metabolised directly into the muscle where they are needed most. - Manufactured in the UK Under strict GMO conditions. - Helps to increase protein synthesis.